All rooms at the Marriott Marquis must be booked by January 27, 2017. It is recommend that you make your room reservation early, since the room block can sell out before the cut-off date. Click here for more information. Two new plenary speakers have been added to the program. The Physics of Music, Michael Ruiz and Solar Astronomy, Stephen Ramsden. These events will take place at Georgia Institute of Technology. Transportation will be provided from the Marriott. It’s not too late to register for an AAPT Winter Meeting Workshop. For those that can’t attend the full meeting, you are still able to sign up for a workshop only registration. If you are already registered for the meeting a workshop can be easily added. There are a number of exciting workshops that are available. To view a full list of workshops with descriptions, please click here. Jay M. Pasachoff will be recognized as the 2017 Richtmyer Memorial Lecture awardee and Jan Tobochnik will receive the 2017 Oersted Medal. 2017 Homer L. Dodge Citation for Distinguished Service to AAPT recipients are Ernest R. Behringer, Ann M. Robinson, Kenneth S. Krane, Sharon Kirby, and Richard Gelderman. 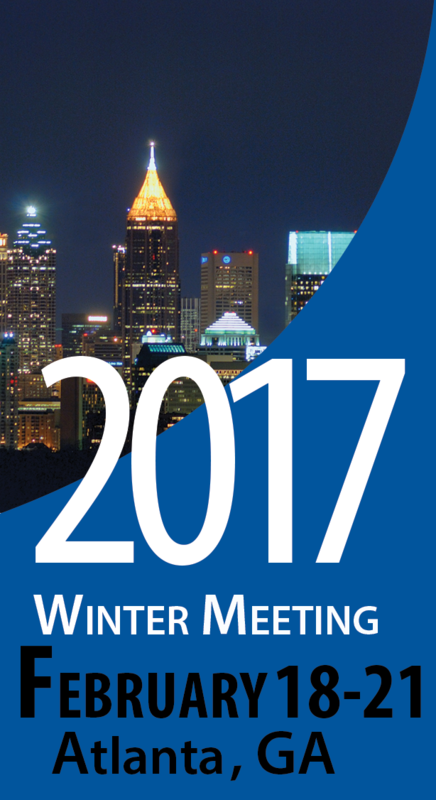 The recipients will be presented their award during the 2017 Winter Meeting in Atlanta, Georgia. AAPT has small grants up to $400 available for AAPT national meeting attendees who are bringing small children to a national meeting or who incur extra expenses in leaving their children at home (i.e., extra daycare or babysitting services) in order to attend a national meeting. In addition, small grants up to $400 are available to national meeting attendees who are responsible for dependent care (elderly parents, adult children with disabilities, etc) or need assistance at the meeting because of a disability. Applications must be received by January 6, 2017. The American Association of Physics Teachers (AAPT) seeks an SPS intern to help design and revise resources for AAPT’s K-12 teacher professional development programs, including face-to-face and digital resources. The intern will have the opportunity to develop a suite of curricular resources, develop and moderate monthly webinars, craft blogs, learn about and contribute to federal education policy, and engage in various grant programs related to heliophysics, the integration of physics and computation, and more. The intern will have the opportunity to attend the AAPT Summer Meeting and provide hands-on programming to high school teacher attendees. The intern will also support eMentoring and online learning by assisting with pairings of mentors and mentees, program evaluation, arranging for a webinar series, and streamlining online resources. 2017 AAPT PhysicsBowl Registration Open! AAPT members just like you are using their online access to The Physics Teacher and American Journal of Physics to develop fresh material for the classroom and the lab, and to keep up to date on current research, pedagogy and physics news. And don’t forget, you have full access to current and archived journal content, making your membership a vital part of your professional development. Do you have a colleague who you would like to refer for membership? From access to the leading publications in physics education, to discounts on meeting registrations and opportunities for recognition, we are confident that joining the AAPT community is a wise investment in the future for any physics educator. At AAPT, we recognize that our members have an unquenchable thirst for knowledge and professional development. Understanding the challenges in finding time to devote to face-to-face learning, AAPT conducts periodic webinars on topics of interest to physics educators. The webinars are an opportunity for you to meet with leaders in physics and science education, to learn about what’s new in educational resources, and to connect virtually with your colleagues. As a feature of your membership, you have access to the growing library of recorded webinars. Interested in participating in the next webinar? Be on the lookout for an email from AAPT with the details! You’ve been waiting all year. Well, your patience has paid off! The 2017 Physics Photo Contest Calendar is in print and ready for a prominent spot on your wall. Each month features one of the top 100 entries from the AAPT Physics Photo Contest complete with explanatory text. If you are a subscriber to one of our print journals, you should have already received a calendar with your December issue. As a feature of membership, all AAPT members, including our digital-only members, can order up to 3 calendars free of charge (shipping charges apply) from our Physics Store. Please submit your Section Report for the AAPT Section News. To list your section meeting in the AAPT Calendar of Events, e-mail the information to dwolfe@aapt.org. See the July 2016 Section News.